We’d love your help. Let us know what’s wrong with this preview of Varjak Paw by S.F. Said. Mesopotamian Blue cat, Varjak Paw, has never been Outside before; he and his family have always lived in the isolated house at the top of the hill. But Varjak is forced out into the city when the sinister Gentleman and his two menacing cats take over his home. With help from his mystical ancestor, Jalal, Varjak manages to overcome challenges such as self-survival and a thr Mesopotamian Blue cat, Varjak Paw, has never been Outside before; he and his family have always lived in the isolated house at the top of the hill. But Varjak is forced out into the city when the sinister Gentleman and his two menacing cats take over his home. With help from his mystical ancestor, Jalal, Varjak manages to overcome challenges such as self-survival and a threat from the gangland cats, and he ultimately discovers the terrifying secrets behind the Vanishings. But can he save his own family from their fate? With wonderful integrated illustrations from acclaimed comic book artist Dave McKean, this book will appeal to all ages. To ask other readers questions about Varjak Paw, please sign up. Are the illustrations key? My library filled my request with the audio version - should I keep looking for a print or e-book edition? can you actually read the books on this site??? first, let's focus on the artwork, because i saw this cover somewhere and i knew that i needed to read this book, no matter what its contents. i really do love dave mckean. 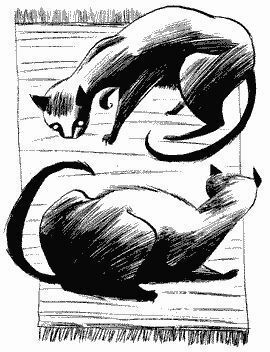 he has been responsible for some of my favorite jonathan carroll covers, and the man just really knows how to draw cats. he gets all the cute stuff - mckean settles for the slinky, creepy, dangerous cats. said does a good job of juxtaposing the pet cats with the feral ones; the stakes of each and their own particular values and mythologies. and now i am off to read the sequel!! Varjak Paw is the only one in his family of noble Mesopotamian Blue cats whose eyes arent green and he is constantly teased and ridiculed for this reason.His older brother even claims this is the reason their owner-the Contessa has stoppedvisiting them and only stays in her room. One who doesnt make fun of him is his grandfather the Elder Paw and Varjak loves to listen to him tell stories about their ancestor Jalals adventures. One day a strange Gentleman arrives with two ominiously black cats and takes the contessa away. Varjak and his grandfather are the only ones who thinks to question the weird events,but the others thinks things are just fine-as long as the gentleman keeps feeding them. The Elder Paw tells Varjak that he needs to go find something called a dog,because its the only thing that can scare the Gentleman away so while the Elder Paw distracts the black cats Varjak sneaks over the wall but he knows they killed his grandfather. In the end Varjak makes it to the city where he makes friends with two cats who teaches him the ways of the city.But even the city has dangers like rival cat gangs and cats mysteriously going missing.And he still needs to find a dog. This was a great book with actual depth to it and not just a cutesy books about cats.For a middle grade book it actually had some dark themes. Maybe its not as dark as Felidae but it does feature some unsettling things that had you wonder even at the end of the book what was going on. The fact you only see the story unfold from a cats viewpoint makes some things unclear and makes the villain the Gentleman seem even more twisted than if we had viewed it from a human characters viewpoint. Varjak was a symphatetic character even if he was far from forceful in his actions and when he finally through his experiences in the city takes charge of things he does suffer a lapse towards the end of the book and falls back into his old role.He gets better though. So its a coming of age story too. The others characters are cats with some human traits but I never felt they were humans in cats bodies.There were just enough catlike qualities to make them interesting. There is a sequel called Varjak the Outlaw wich I plan to read. Can't believe this brilliant book has escaped me for so long. Beautifully written and illustrated. Possibly too challenging for my Y3 class but keen to share widely with all children across KS2. I saw this book in the store, and the cat on the front cover was so adorable that I had to buy it for my sister. Of course, then I had to read it before giving it to her! This is definitely a kids' book - not even YA, but for younger children. However - it's also an excellent book. 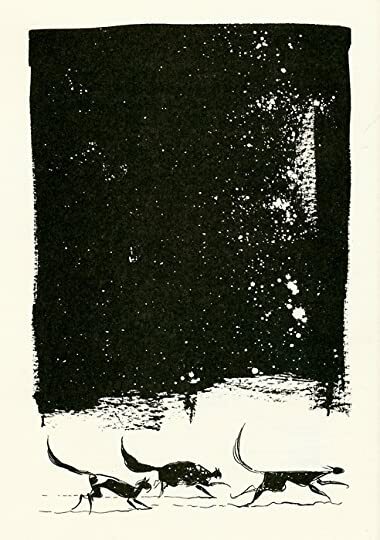 McKean's illustrations are perfect for the characters and the story. Varjak is a young Mesopotamian Blue cat who's been brought up to think he's something special. However, when his owner disappears and a strange and sin I saw this book in the store, and the cat on the front cover was so adorable that I had to buy it for my sister. Of course, then I had to read it before giving it to her! Varjak is a young Mesopotamian Blue cat who's been brought up to think he's something special. However, when his owner disappears and a strange and sinister man appears in his family's house, a dream connection with his legendary ancestor leads him to venture into the dangerous outside world, where he learns to reevaluate his priorities - as well as questing to save his family from the danger he's sure they're in. It's a sweet story - but it's also got some genuinely spooky elements - and it's definitely in the realm of the fantastic. I bought this at a book sale one day and I only bought it because it had a cat on its cover...and I am not disappointed. What can I say? I'm a cat person! Although this is more of a children's book and I could totally predict what could happen, I still found myself enjoying it. Teaches some lessons and the artwork is pretty neat. Almost a life manual for us all. The idea that no one is too special to help others and that comfort zones hold us back seem to have special relevance to the UK's current treatment of refugees. 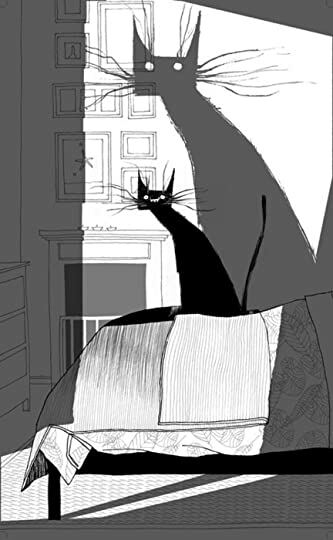 Clever writing and brilliant characters - it's easy sometimes to forget it's about cats! Brilliant book! Vividly imagined by SF Said with stunning illustrations by Dave McKean. This is a must-read for MG fans. My sister is doing a reading competition for her school and was given a bunch of books to read, and this was one of them. I try not to pass up a chance at reading free books, even if they're ones I wouldn't pick out of a bookshop, and thankfully Varjak Paw, though a children's book, turned out to be a great read - extremely easy and fast to get through without being boring at any point, it had lovable main characters and beautiful atmospheric illustrations (as expected of Dave McKean, whose work My sister is doing a reading competition for her school and was given a bunch of books to read, and this was one of them. I try not to pass up a chance at reading free books, even if they're ones I wouldn't pick out of a bookshop, and thankfully Varjak Paw, though a children's book, turned out to be a great read - extremely easy and fast to get through without being boring at any point, it had lovable main characters and beautiful atmospheric illustrations (as expected of Dave McKean, whose work I was familiar with from Coraline [he was half the reason that book gave me nightmares]). It did confuse me sometimes though - it was only until I literally turned the last page and closed the cover to see the preview of the second book on the back, which featured the blurb "The Kung-Fu Kitty is Back", that I realized that I should have been visualizing all the fight scenes in a martial arts sense rather than just, you know, cat fights. 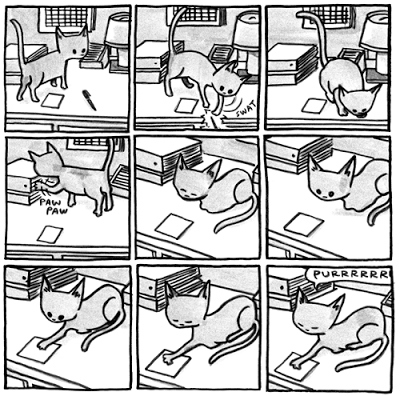 All through the book I'd had trouble imagining how cats could fight using such fancy moves in my mind. There was also the matter of the "toy cats" that play a role in the end; I'd initially thought of them as normal battery-powered talking cat toys, then taxidermied cats, but then it seemed more like they were some kind of mind-controlled robot/cat hybrids...? And finally, it felt to me like Varjak's successes were too easily handed to him; he basically became a warrior through deus ex machina dreams and was able to use new Skills almost as soon as he learned them, after only being shown them once or in some cases just having them explained to him. And in the first place, it's never really explained why he has these lucid dreams. This thrilling story follows Varjak Paw, a Mesopotamian Blue cat living in the house of Contessa on top of a hill. His family bully and ignore him, and his eyes are the 'colour of danger'. Varjak Paw is successfully portrayed as different to everybody else (something that some children may be able to relate to), and soon becomes increasingly desperate to see the world outside of the Contessa's house, something he has never done. The Contessa soon becomes sick, and when a sinister man with two black cats comes onto the scene, Varjak is certain that the Contessa is dead. Varjak's desire to leave the house on the hill becomes reality when the Elder Paw, the head of the family, tells Varjak to journey to the outside and to bring back a dog to scare the man away. Eager to succeed, Varjak learns the way of Jalal, an ancient martial art passed down through his ancestors. S.F. Said's choice to mix cat behaviour with martial arts is really effective, whilst the beautiful illustrations by Dave McKean help bring the story to the next level. In the story, Varjak also learns about sacrifice, prejudice and how to build relationships, making this book ideal for discussion about feelings. Although the story is simple, it is fast-paced and had me gripped from start to finish. It's a pleasantly creepy story, and the mood is pretty dark a lot of the time. The ideas are very original and S.F. Said adds suspense sufficiently. Said's beautiful use of metaphors and similes make this literate, challenging and engaging enough for children, and the unpredictable ending will make this book very memorable. Although appealing to children, Varjak Paw has many qualities that a variety of ages would appreciate. With its dark nature, I feel that it would not be appropriate for very young children, however this is a fantastic choice for children that love a creepy adventure! This kept me on the edge of my seat throughout. Varjak Paw belongs to a family of Mesopotamian Blue pedigree cats who are owned by the Contessa. However, she has rarely been seen recently and when a mysterious gentleman turns up with two uncanny black cats of his own, the Contessa disappears. Being only concerned with comfort, safety and good food, Varjak's family are blissfully ignorant of the dangers Varjak can sense. Plus, Varjak, with his yellow eyes - something no true blue would ever be pr This kept me on the edge of my seat throughout. Varjak Paw belongs to a family of Mesopotamian Blue pedigree cats who are owned by the Contessa. However, she has rarely been seen recently and when a mysterious gentleman turns up with two uncanny black cats of his own, the Contessa disappears. Being only concerned with comfort, safety and good food, Varjak's family are blissfully ignorant of the dangers Varjak can sense. Plus, Varjak, with his yellow eyes - something no true blue would ever be proud of - has never really fitted in. Only Elder Paw trusts and believes Varjak. Elder's tales of their ancestor, Jalal have always inspired Varjak and filled him with a longing for more. Now, with his family in danger, Varjak must be inspired once, this time into action and to venturing into the Outside. Varjak must face many dangers; cat gangs, cars, dogs and the strange Vanishings, before he can fulfil his potential and save his friends and family. Will Varjak ever belong? Follow him as he learns important lessons, not least how to believe in yourself and to recognise true friendship. Varjak Paw is a Mesopotamium Blue kitten, living in a house on top of a hill, he has never left the high walls that surround the Contessa's garden. His family are happy to recline in the knowledge that a strange man will feed them caviar, as they admire their own handsome pedigree. Varjak however is bored, an outcast, unlike his siblings his name doesn't begin with J and he has eyes the colour of danger - he is desperate to see the world outside of the contessa's house. Armed with the wise words Varjak Paw is a Mesopotamium Blue kitten, living in a house on top of a hill, he has never left the high walls that surround the Contessa's garden. His family are happy to recline in the knowledge that a strange man will feed them caviar, as they admire their own handsome pedigree. Varjak however is bored, an outcast, unlike his siblings his name doesn't begin with J and he has eyes the colour of danger - he is desperate to see the world outside of the contessa's house. Armed with the wise words of Elder paw, Varjak learns the way of Jalal an ancient marshall art passed down through his ancestors. I am currently reading this book with my 3c guided reading group. A great text for inference and discussion about feelings. Varjak is bullied by his siblings and ends up entering in to a dark world of gangs and danger. I read this over 2 nights and thoroughly enjoyed it and the story really engaged my group from the very beginning. Το βιβλίο προορίζεται για μια πολύ στενή ηλικιακή ομάδα, αυτή των 8-14 ετών. Για την ομάδα αυτή είναι ενδιαφέρον, ευκολοδιάβαστο και με μηνύματα που παλεύουν να μην ισοπεδωθούν από τη σκληρή πραγματικότητα. Στους υπόλοιπους δεν μπορεί να δώσει κάτι, πέραν του να περάσουν την ώρα τους όταν δεν υπάρχει κάτι καλύτερο να κάνουν. Ένας συμπαθής, άβγαλτος γάτος ράτσας (μάθαμε και τη ράτσα Μπλε της Μεσοποταμίας) φεύγει από το σπίτι του για να γνωρίσει το Έξω. Σιγά σιγά και με τη βοήθεια πιο περπατημένων Το βιβλίο προορίζεται για μια πολύ στενή ηλικιακή ομάδα, αυτή των 8-14 ετών. Για την ομάδα αυτή είναι ενδιαφέρον, ευκολοδιάβαστο και με μηνύματα που παλεύουν να μην ισοπεδωθούν από τη σκληρή πραγματικότητα. Ένας συμπαθής, άβγαλτος γάτος ράτσας (μάθαμε και τη ράτσα Μπλε της Μεσοποταμίας) φεύγει από το σπίτι του για να γνωρίσει το Έξω. Σιγά σιγά και με τη βοήθεια πιο περπατημένων γάτων αλλά και ενός προγόνου - ήρωα καταφέρνει να ξεβγαλθεί στον κόσμο και να ηγηθεί μιας ομάδας περιπετειών που φαίνεται ότι θα ακολουθήσουν. My boyfriend suggested I read this while I was ill this week (I was reading Station Eleven, which is not a comforting book when you've got the flu!!) and it was a brilliant idea. A really lovely story with beautiful illustrations, which genuinely touched me. I can't begin to explain how awesome this book is. This book basically reeled me in at the library when I realized it was talking about ninja cats. Yeah, that's right. And I was not disappointed at all. This book was adorable. Adorable. But also subtly creepy. You don't get any backstory on the mystery, you have no idea what is going on or why - which is pretty common in kids books, but still is a little alarming in this one. The characters are cute, but simple, and of course Varjak takes to the Way quickly because, hey, it's a kids book. And he This book basically reeled me in at the library when I realized it was talking about ninja cats. Yeah, that's right. And I was not disappointed at all. This book was adorable. Adorable. But also subtly creepy. You don't get any backstory on the mystery, you have no idea what is going on or why - which is pretty common in kids books, but still is a little alarming in this one. The characters are cute, but simple, and of course Varjak takes to the Way quickly because, hey, it's a kids book. And he is an awesome cat. But my most absolute favorite of all is Cudge. So cute and sweet. The outside world was a mystery and any adventures Varjak Paw had were through the stories his grandfather told him about heroic ancestor martial arts expert, Jalal and his travels around the world. Varjak Paw is a Mesopotamian Blue cat, with bright golden yellow coloured eyes which are described as the colour of danger. Varjak Paw lives with the rest of his family in the countess’s house on top of the hill. His family consists of his parents, grandfather, and four siblings and a cousin. He is the second eldest of the children, and often ignored by his parents and has a rough relationship with his older brother Julius who constantly teases and bullies him because he doesn’t have green eyes like the rest of the family. However, Varjak Paw does have a close relationship with his grandfather who share tells him stories of their great ancestor hero Jalal, his travels and use of martial arts in defence. Varjak’s Paw’s family has always lived in the contessa’s house from the time of ancestors and have never left the comforts of their house to look beyond the walls in to the wildness of the world. Until one day the contessa is taken ill, Varjak suspects that she may have died as a strange sinister looking man with two evil black cats’ moves into the house. Something doesn’t feel right senses Varjack Paw…. Growing up Varjak Paw has got more and more curious about the outside world and now with the arrival of the two evil cats and their owner, Varjak has the opportunity to brave the world that he has grown so curious about. 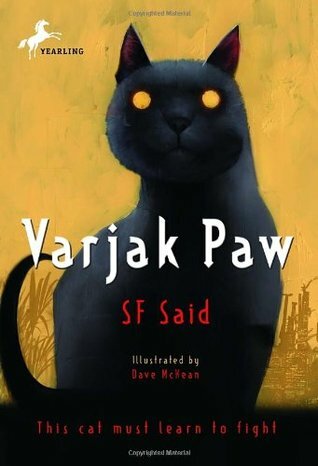 Varjaks grandfather decides that it’s time to take drastic action to protect the family, so he tells Varjak Paw to go out in the world, to find a dog to scare the evil cats and their owner away. Varjak Paw’s adventure begins, he steps outside the walls of the house, petrified, nervous, scared, unsure of what to expect and how he will overcome the huge task ahead of him. Varjak Paw has dreams of his ancestor Jalal and through his dreams he learns martial arts and overcomes the defeats rival gangs and befriends a dog. Varjak Paw is a gripping read, with dark and scary moments; it keeps u hooked and wondering as to how he overcomes the hurdles and dangers. This book is ideal for Key stage 2 readers. A tale of Varjak the cat, descendant of the great Jalal, finding his identify in the big world. Varjak an outcast grew up with his parents and his siblings being told the story of Jalal by his grandfather. Jalal was a brave and courageous cat who after 100 years has left a legacy for his descendents to follow. Varjak Paw years to have an adventurous life where he can show his siblings he is worthy of being a descendent of Jalal. His opportunity arises when the countess dies and the house is occupied with a mysterious man, Elder Paw, Vrajak’s grandfather warns him that no good will come out of this new situation and that he needs to leave the house he has been accustomed to since birth and must befriend a dog who will help free them from the grasp of the gentleman. Varjak Paw leaves after the gentleman’s black cats attack his grandfather, once on the other side of the wall, Varjak realises he is alone and contemplates how he will survive in the real world. He begins having dreams where Jalal the great helps him learn the seven basic survival techniques which would help him overcome any difficulties. With the help of Jalal and a cat Varjak befriends, they embark on a journey finding a dog that would be willing to help. After learning the seven survival techniques, Jalal goes back to his family to fight the gentleman only to find the gentleman has been kidnapping stray cats from the town and killing them to make stuffed toys. In a room he finds a cage with several cats who are awaiting their fate of being turned into a stuffed animal. Varjak paw defeats the two black cats but is helpless when it comes to fighting the gentleman, but luckily Varjak’s friend the dog arrives at the right time and is able to win the quest for Varjak, allowing all the cats to escape from a vicious fate. Varjak claims the position of the leader amongst his family however turns the position down as he realises he is much more than a house cat and has many more adventures awaiting him. An ideal Gothic tale for beginners outlining betrayal, adventure and unexpected twists. An easy read for children aged between 7-9 years of age. This has been one of those books that has been recommended to me by GR but one that I wasn't ever quite certain of. Then a few weeks ago I ended up going to our used bookstore in town to get another book from the window that I had been eyeballing for quite a while and with that visit we ended up looking through some of the other YA books they had for some older treasures when I came across this book. Deciding what the heck I chose to go on ahead to get it then used it as my rebound book since o This has been one of those books that has been recommended to me by GR but one that I wasn't ever quite certain of. Then a few weeks ago I ended up going to our used bookstore in town to get another book from the window that I had been eyeballing for quite a while and with that visit we ended up looking through some of the other YA books they had for some older treasures when I came across this book. Deciding what the heck I chose to go on ahead to get it then used it as my rebound book since of some heavier yet unsatisfying current reads. The author has seen to it that the story's characters are thoughtfully developed to reflect current personalities and with deep emotional impact to the readers so that we are reminded of both the similarities and the differences we face when looking at each other. Faced with spirit and pluck the issues they face are also reflections of the same problems that we are now facing in this world thus bringing the book that much closer to home for any readers who may be charmed with the plot. At the same time the writing is short, simple and easy to read so a great book for those who are still transitioning from juvenile fiction to YA. And with beautifully simplistic drawings that lean a bit towards cartoonish to break-up the story for those who may need a break the reader will find themselves taken into another world that is just as much similar at times as it is just a bit foreign. Once again a matriarchal society has been transformed into a patriarchal one, largely inhabited by male characters, but still, it's about cats, so I had to love it. Plus I really love that cover with the golden eyes. And yes, I did google to see if the breed really existed. Casting about for the next read-aloud after the Penderwicks, we struck on this. Glad I finished it last month. Also, very glad that the McKean illustrations aren't as disturbing as the ones he does for Gaimain's books. It Once again a matriarchal society has been transformed into a patriarchal one, largely inhabited by male characters, but still, it's about cats, so I had to love it. Plus I really love that cover with the golden eyes. And yes, I did google to see if the breed really existed. It's a cat adventure, therefor good. But this second time through, I'm thinking about the cliche of special training, and the hero who is unusually adept even before the training. Also, I'm wincing from the contempt for the hunting abilities of pets. I know a cat who doesn't have claws and still managed to kill a mouse by pushing a carton of sodas over on top of it. Pets can kill, too. This is an entertaining novel, beautifully illustrated. It tells the story of one Varjak Paw, a cat from a noble line of Mesapotamian Blues. Varjak is a bit of an outcast in his family, what with his obsession with going Outside and his dislike of simply sitting around looking dignified. When the Countess (the owner of Varjak and his family) dies, a sinister man with two even more sinister black cats comes into the picture. Varjak must escape to the Outside, learn the cat martial arts, and retur This is an entertaining novel, beautifully illustrated. It tells the story of one Varjak Paw, a cat from a noble line of Mesapotamian Blues. Varjak is a bit of an outcast in his family, what with his obsession with going Outside and his dislike of simply sitting around looking dignified. When the Countess (the owner of Varjak and his family) dies, a sinister man with two even more sinister black cats comes into the picture. Varjak must escape to the Outside, learn the cat martial arts, and return to save his family. The actual plot is not particularly strong, but it's a nicely creepy story, and the ideas behind it are very original. A dark, gripping and pacy feline adventure that is vividly-imagined and beautifully told. Dave McKean's quirky illustrations brilliantly complement the story. A delightful read.